The Sun and it's storms affect the paranormal more than people would think. Given that this solar cycle is characterized by low activity on the sun and fewer than normal numbers of sunspots, it would be interesting to see if there has been a notable downturn in the numbers of paranormal events on the planet as a correlation. Similarly, as the solar activity increases, the theory holds that there are increased numbers of paranormal events to match the solar cycle events. Ghosts and spirits depend on increased energy to manifest, be it in the form of storms, rain, loud sounds and, even space weather changes like auroras and geo-magnetic storms. So it makes sense to try to forecast when we might see more activity on the basis of space weather as a potential driver of increased paranormal events. We're starting the first of what we hope will be many EVP top tens. Our first year of operations has netted hundreds of EVPs and we want to present what we feel to the be the best of the best. We'll provide links to each, with the format being a top-ten countdown to the best of the best. Each EVP link will have a story behind it to give you the inside skinny on what happened and how we picked it up! So come with us, on a journey through the many cases of 2008 here at GRI. We've seen the site take off with literally tens of thousands of visits and we thank you, our members and the sites we investigated for their gracious time and help! I have on occasion, been visited by Angels. Some call them their Guardians..and this has merit. There are beings that you either can or cannot see, that are looking out for your own well being, and those around you. I have a video link for you, and if this doesn't lead you to believe in Angels, I hope it spurs your curiosity to research this phenomenon a bit further. Bless you always, and may your Guardian Angels always see you safely home!! A typically benevolent celestial being that acts as an intermediary between heaven and earth, especially in Christianity, Judaism, Islam, and Zoroastrianism. A representation of such a being, especially in Christianity, conventionally in the image of a human figure with a halo and wings. angels Christianity. The last of the nine orders of angels in medieval angelology. From the highest to the lowest in rank, the orders are: seraphim, cherubim, thrones, dominations or dominions, virtues, powers, principalities, archangels, and angels. A guardian spirit or guiding influence. A kind and lovable person. One who manifests goodness, purity, and selflessness. Informal. A financial backer of an enterprise, especially a dramatic production or a political campaign. On December 20'th, myself and Christine B, from El Dorado Paranormal, joined forces to do a radio show at her 1 PM Saturday show at KFOK studio and then left from that location to head out to do a day-tour of known haunted spots around the county. 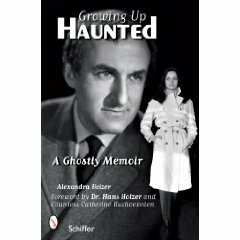 We arrived at 12:45pm to prepare for an interview with Alexandra Holzer, the daughter of the well-known paranormal book writer and investigator, Hans Holzer. Little did we know what a totally fun person Alexandra would be. After the public announcement spots (and I did my first commercial ever!) with Alexandra on the line, we found ourselves laughing at the stories and observations that Alexandra told us about her life. She runs a group of investigators out of New York called "New York City's Pretty Paranormals Intuitive Investigative Team" or "NYCPP" for short. ""Be an independent in the field of the paranormal and WORK with others as one big universal team." Now *this* is ideal to see in our field! I'm impressed and think that this should be a standard saying and practice on all sites! It's how we should be as investigation groups, sharing knowledge, ideas, techniques and data openly! 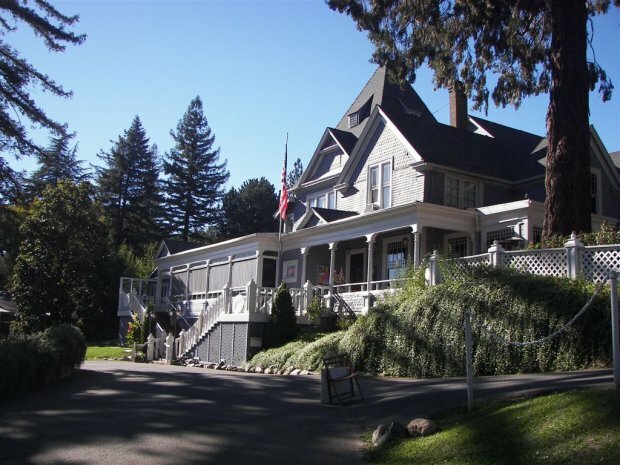 On August 18'th, 2007, I had just investigated the Albert Shafsky House Bed and Breakfast with a local paranormal group who led a tour that day of Placerville. The entire event was captured over a one hour period with a number of investigators reaching the second floor and sitting for a long time in the parlor where we had a great time talking over old cases and the like. I had forgotten that I had run my first little MP3 recorder, an Iriver model IFP 900, during that talk and what happened was that I put the recorder away and then promptly forgot about that evidence. To make a long story short, I found the evidence the other day and ran a standard analysis on it and was surprised at what happened during our talks. The sounds of men and women talking, whispers and the odd noises of what sounds like poker chips permeate the recording. 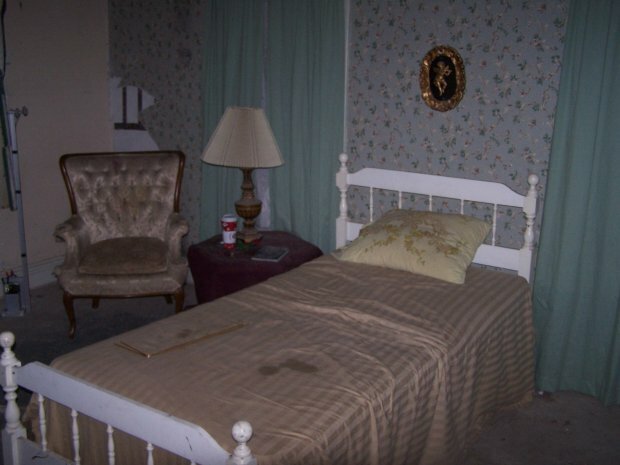 Based on the evidence collected, I'd say that the Albert Shafsky House Bed and Breakfast does merit investigation by a smaller team to do focused EVP work there to see what comes up on the second floor. On November 29'th, 2008, I walked into the Wolfe Manor gathering. having arrived after a 200 mile drive to Fresno at the hotel where TAPS and Ghost Hunters International was featured along with other interesting groups and speakers. It was well worth the drive and a treat after a year of building up GRI as an investigating organization. Mark and Debby Constantino were amazing presenters and their slide show on EVPs and methods to improve captures was very enlightening. I was especially taken with the notion of bringing gifts to locations where spirits might be and, in fact, had done so on November 27'th, two days prior to this event, and had great results with it. In my own case, I took pumpkins to a local cemetery to give back a little something to the locals interred there and the EVPs that were picked up were mostly "thank yous". It was nice to learn I was on the right track. After all, it's one thing to hear spirits, another to interact with them in profitable and enjoyable ways and being nice and doing something for them was something I was gravitating to always. I have always wanted to write out a story about this creature. There is another article written about it that I am very close to, but I dictated it to the Bigfoot Society, and they posted it in their magazine. Why you ask did I do that? Well... I must tell you I've seen of these creatures during my life and they are unforgettable. I have seen two and one of them left footprints that are currently housed at the Anthropology Lab at Washington State University in Pullman. I saw this one in Coeur d'Alene Idaho back in 1976. I will NEVER forget it. Our family had friends that had a few cabins just above Lake Coeur d'Alene and we used to go there for a few weeks in the summer and hang out. Me and my sister were allowed to bring friends with us, and it was always a good time. We would spent the long summer days boating, skiing, playing kick the can and getting spooked in the woods at night. If you have never been to Coeur d'Alene, it in itself is pretty creepy. It is kinda like being at Camp Crystal Lake in the movie " Friday the 13th." Radio interview - Journey Paranormal and some of my EVPs played. Three of my clips from the operating room next to sick bay were played and I was very honored to be asked to call in to talk over my evidence and to interact with the host and guests. Annette runs a quality show and it was great to speak with Sharon and Marcia again! 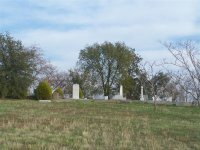 We visited Clarksville Cemetery on November 22'nd 2008 after wanting to visit this beautiful cemetery for many years. It is plainly visible to those who know where to look on Highway 50 as people drive east towards Placerville. Having an hour to spare, I drove to the nearby church, parked and climbed the hill to the cemetery. The grounds are surrounded by a fence and the rear fence is currently down. The site appears to be publicly accessible and thus I carefully and quietly entered with camera and evp gear in hand. The gear used was a Kodak Easyshare Z740 and a Sony ICD-P620. These are my workhorse tools, easy to carry, lightweight and rugged for most jobs. I collected a large number of EVPs on this 45 minute jaunt and was surprised to find intelligent responses in a number of the captures. Over 100 photos were taken since there appear to be only a few sites with pictures and a current bevy of them probably didn't hurt to have on hand. The photo and audio archive can be viewed and heard on this site at this link. I highly recommend downloading some of the MP3s to listen to the less clear EVPs and tell us what you think. I was at work today, and kept finding pennies where I would walk, or sit. I've always picked them up, and said, " Thank you!! " and put them in my pocket. I've collected hundreds of them. They appear out of thin air. Where I had been sitting moments before, now appeared to have a penny right below the chair. I collected five of them this evening..sometimes I collect more, sometimes less. I've always lent an ear to the myth that when you find these pennies, someone that has died is thinking of you. I wanted to get some feedback from all of you reading this..What is your take on this theory? Have you had any strange occurrences with this phenomenon? Let me know if you would. I am formulating a thesis for this subject.